Connecticut is home to 89 colleges and universities, many of which are located in the densely populated southwestern region of the state, comprising one-third of the Tri-State Area, along with New York and New Jersey. With a brief yet selective list of Connecticut schools to choose from, the process of comparing colleges may seem overwhelming. Program length, location and affordability are just a few of the factors most prospective college students should carefully investigate. 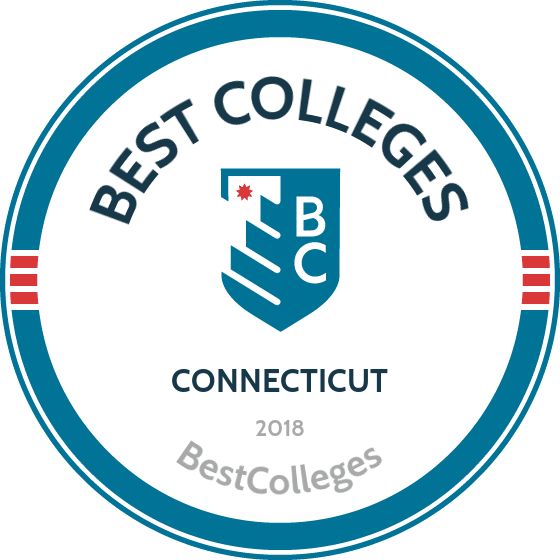 Fortunately, we have applied our rigorous methodology to the latest education data to rank the best colleges in Connecticut, including the top four-year and two-year schools. Four-year institutions in Connecticut include several world-renowned Ivy League programs. Many four-year liberal arts colleges and universities in Connecticut identify as Ivy League not only for their history and stature in higher education, but also for being competitive, exclusive and academically elite. Connecticut is the birthplace of many private four-year institutions that were founded pre-19th-century; historical significance as well as academic and social prestige have produced the terms "little ivies" and "seven sisters," used to describe smaller colleges and women-only institutions, respectively, aspiring to be affiliated with the official Ivy Leagues. Beyond the prestige of a historical alma-mater, a four-year education in Connecticut is highly desirable in the workforce. Graduates of Connecticut's top four-year colleges and universities have an average earning potential of up to 88% more than high school graduates, and salaries after college graduation from Connecticut schools are generally above the national average. To facilitate this journey, the Hartford Consortium of Higher Education supports a partnership with the Connecticut branch of Jobs for America's Graduates to support high school students in their transition into post-secondary education. Now is a great time to begin your four-year degree in Connecticut. We've compiled this list of top colleges to help you start your search. Of all the colleges in Connecticut, none is more prestigious than Yale. Founded in 1701, it is the state's oldest university and one of the world's most eminent names in higher learning. This Ivy League institution counts among its alumni 32 Pulitzer Prize winners, 20 Nobel laureates, 19 Supreme Court justices, and five U.S. presidents. Students of Yale hail from all 50 states, while international students represent 118 countries. The school's undergraduate enrollment totals 5,450 students. A renowned research university, Yale instills in its students a lifelong endeavor to question, challenge, and discover. Undergraduates pursue liberal arts degrees that encompass both depth and breadth of knowledge amid a demanding curriculum, crafted from roughly 2,000 courses for nearly 75 majors. Some of these include astronomy, history of science, medicine, & public health, and women's, gender, & sexuality studies. "Lux et veritas" or "Light and truth," is the Yale motto; As for enlightenment, Yale students are destined to spend hundreds of hours at the Yale University Library. A massive collection of more than 15 million volumes housed in 15 buildings, it is the third-largest academic library in all of North America. Located in Middletown, Wesleyan is one of many notable liberal arts colleges in Connecticut, offering an open curriculum that gives students time explore their scholarly passions. It offers 45 majors, 14 minors, and 12 certificates that are "interdisciplinary by design" and thereby boundless. In particular, minors can be combined to either craft a cohesive concentration or splinter into a new direction wholly unrelated to one's major. At Wesleyan, such academic exploration is encouraged to ensure that every student gains the knowledge and skills they need to inspire, lead, and succeed. The school's first-year seminars (FYS) offer an introduction to a variety of topics, from Kafka to neuroscience, with the main aim being to stress the importance of writing at the university level. Beyond the books, undergraduates at this Little Ivy campus will find a rich collection of student-run groups that cover most every interest, from sports to politics to social issues. Ever since its founding in 1831, Wesleyan has made it a point to get students involved and thinking outside the box -- back in the 1830s, the school already had a vegetarian club. Second-oldest among Connecticut colleges, Trinity is a private liberal arts college that stresses independent thinking. The school offers 39 majors, 27 interdisciplinary minors, and over 900 courses. Undergraduates are encouraged to explore the areas of study that truly interest them and through a 21st-century approach, craft a personalized degree program. Around 2,200 students are enrolled at Trinity each year, filling the 100-acre campus with culture and community. Notable among the school's distinguished academic centers is Trinity's Center for Urban and Global Studies (CUGS). One of the first centers of its kind, it focuses on better understanding a new global society in which more than half the world's population lives in cities. More than 60% of Trinity students study away from the campus during their undergraduate years, with programs available in New York City and as far away as Barcelona. Fifteen percent of undergraduates pursue double majors and around 25% major in an interdisciplinary field (e.g. : neuroscience or public policy and law). The University of Connecticut in Storrs is a public research university, serving more than 30,000 students yearly across five campuses as the flagship university in the UConn system. With a catalog of over 100 undergraduate majors, students are bound to find their desired academic path. If not, they can customize a plan of study -- the only requirement being a group of core courses chosen by the university to provide "intellectual breadth." Founded as an agricultural school in 1881, the University of Connecticut today consists of 17 schools and colleges. Located in the rural village of Storrs, it is also a vital part of its surrounding community, both economically and demographically. UConn's annual enrollment tops 30,000 every year, and more than 100 countries are represented by UConn's international students. The school is also one of the best colleges in Connecticut for athletics, bringing home national titles and national attention, especially as a Division I basketball powerhouse. Connecticut College, a private four-year liberal arts college in New Haven, emphasizes real-world experience and undergraduate research work in an open curriculum. There are 41 traditional majors and 42 minors with over 1,000 courses available across 29 academic departments. On average, enrollment per class is 18 students. Nearly all of Connecticut College's 1,900 students live on campus and all are encouraged to get involved, both inside and outside the classroom. The college's shared governance system, for example, has students working with faculty, staff, and administrators on policy-making committees that address everything from budget concerns to curriculum changes to sustainability efforts. All students sign an honor code, created by the students in 1922, that fosters trust and openness and sets the tone for campus life. Among Connecticut colleges, Conn is a leader in study away programs, and is one of only a handful of schools in the nation that offers every student a funded internship the summer before senior year. From the class of 2017, 75% of participating students interned outside the state, and from this group, 15% went abroad, working in Brazil, Austria, South Africa, and China. Among Connecticut colleges, Central of CSU is the state's oldest publicly funded university dedicated to learning in the liberal arts and sciences. It features four schools and as a partner in the New England Higher Education Compact, offers students in other New England states the opportunity to enroll at CCSU at a discount. Founded as a teacher's college in 1849, Central today offers instruction for a wide range of disciplines and has a student population of over 12,000. Undergraduates can choose from over 100 majors in more than 80 fields of study, with opportunity to study abroad through the university's partnership with 70 educational institutions in 40 countries. On its suburban campus, CCSU offers four undergraduate degree programs: a BA, BS, BFA, and BSN. Its student-to-faculty ratio is 16:1. Accepted students can live on campus in one of nine residential halls, each its own community. Central students are encouraged to participate in organizations, clubs, and the arts to gain a better understanding of the world and develop civic responsibility. Fairfield is a private, coeducational university built around a Catholic Jesuit tradition that aims to foster a sense of community and prepare students for the world by presenting a kaleidoscope of viewpoints. Students hail from 35 states and 47 countries. Providing a liberal arts education, Fairfield's mission is to "turn strengths into careers" and since its founding in 1942, has awarded over 45,000 degrees. Founded by the Jesuits, Fairfield University is one of 28 members in the Association of Jesuit Colleges and Universities. Among colleges in Connecticut, Fairfield has emerged as a leader in accounting and nursing, offering nationally-recognized programs and a strong success rate for new graduates. For undergraduate students, Fairfield's Core Pathways resides at the center of every degree, providing ideas and fundamentals meant to guide students throughout their academic journey and beyond. From engaging traditions to scientific reasoning, this core curriculum is the foundation upon which students discover and build their study focus. Students at Fairfield can choose from 46 majors and 21 interdisciplinary minors. Founded in 1905 as the St. Vincent's Hospital Training School for Nurses, St. Vincent's today continues to be a leader in educating the next generation of nurses and allied health professionals. Unlike most colleges in Connecticut that offer an open curriculum, St. Vincent, a faith-based Catholic institution, focuses more on the health sciences and preparing future health professionals. Students accepted into St. Vincent's associate degree programs in nursing or radiography will study at one of the college's two Bridgeport campuses. The college's curriculum, while based on the academic principles founded over a century ago, has evolved to meet today's technology and lab sciences. The school offers over a dozen certificate programs, along with general education courses in the social sciences, humanities, and math and science. Those who wish to pursue their bachelor of science degree can do so through the college's online learning programs, while also furthering their studies and experience via hands-on work in the community or St. Vincent's Medical Center. Founded in 1889, ECSU is one of the many colleges in Connecticut that began as a school for teachers. Today, the university enrolls 5,200 students a year, including 4,200 undergraduates. Organized into three schools, the university offers undergraduates more than 30 majors, from accounting to women's studies, with a student-to-faculty ratio of 23:1. A majority of its first-year students live on campus, with six residence halls dedicated to incoming freshmen. The school has 17 athletic teams. Among Connecticut colleges, ECSU has emerged a leader on sustainability issues. In 2001, the Institute for Sustainable Energy (ISE) opened on the 182-acre suburban campus. Serving as a source for information on energy efficiency and sustainability, ISE works with state agencies, municipalities, and other educational institutions to develop and implement policies for a sustainable world. SHU is a Roman Catholic university founded in 1963 and is notable for being the first Catholic college in the U.S. to be staffed by the laity. School enrollment in 2016-2017 topped 8,500, with nearly 4,800 full-time undergraduate students. It is the second-largest Catholic university in all of New England. SHU's motto is "Inspiring Minds, Unleashing Hearts", and students are encouraged to take their time in choosing a course. Fifty-five traditional majors are available, but for those undecided, SHU offers a "major in success" program to help students unlock their academic path. Former students include actors John Ratzenberger and Kevin Nealon. As with many other Connecticut colleges, Sacred Heart's approach to learning is rooted in the liberal arts, while adding Catholic intellectual traditions. The school stresses collaboration, inside and outside the classroom, and is a clear leader when it comes to community work. Each and every year, SHU provides 85,000 hours of volunteer service. SCSU is one of four state universities, and one of 17 Connecticut colleges and universities that comprise the Board of Regents' CSCU. Founded as a teachers' college in 1893, Southern today awards graduate and undergraduate degrees in the liberal arts and professional studies along with teacher certification. Many local educators got their start at Southern. SCSU offers more than 60 undergraduate programs and over 50 minors, as well as preparation for admission to medical, dental, and veterinary schools. The school also helps guide students toward a military commission via R.O.T.C. programs with the Air Force and Army. With enrollment of 11,000, Southern manages to accommodate all students on one 170-acre campus, with the academic and residential sections built on opposite sides. The school is a strong New Haven representative in athletics, sponsoring 17 collegiate teams in Division II. A number of alumni have gone to play professional football and soccer, and 75 in track and field, swimming, and gymnastics have won individual NCAA titles. Of all the colleges in Connecticut, the best known during an election season is no doubt Quinnipiac University, home to the Quinnipiac University Polling Institute, which provides the public, pundits, and campaigns with fresh insight into voter perspective through its widely respected surveys. The school offers 58 majors, 45 minors, and 16 dual degree programs to undergrad students. More than 6,300 courses are offered across a wide range of disciplines, and experiential learning is a hallmark of Quinnipiac scholarship. Among Connecticut colleges, Quinnipiac stands out when it comes to broadcasting, journalism, and the media arts. The Quinnipiac Chronicle is the school's student-run weekly newspaper. Students also run their own FM radio station, WQAQ, and the official television station of the university, Q30. COSC is a virtual liberal arts school that has awarded over 11,000 degrees since it was established in 1973. Its motto is "degrees without boundaries", and it offers flexible programs to assist students at every point of their academic journey, whether at the start, the middle, or nearing the end. The school offers associate, bachelor's, and master's degrees, and is accredited by the New England Association of Schools and Colleges. It is also a member of the Board of Regents' CSCU, partnering with 12 other Connecticut colleges and four state universities. COSC features six majors, including a general studies major with a choice of 12 concentrations, from criminal justice to public safety administration. It also offers a number of certificates in the fields of healthcare, early childhood, and paralegal studies. Charter Oak College honors a wide range of transferable credits and life/work experience through testing options that allow students to demonstrate what they already know. At COSC, tuition is also tailored to every student and their particular circumstances. Founded in 1903, WCSU is a public university offering fine arts and professional programs. Students can choose from more than 40 majors, taught across four schools on the school's 400-acre urban campus. WSCU features enrollment of nearly 6,000 undergraduates a year, and over the last 10 years, has produced four Fulbright scholars. The school's study abroad program is quite comprehensive, with more than 300 locations in over 50 countries, available for semester, yearly, or summer stays. One of the best colleges in Connecticut for conservation efforts is WCSU, which has long promoted environmental custodianship. The university's Jane Goodall Center for Excellence in Environmental Studies, founded on the campus nearly 20 years ago, helps foster an understanding and awareness of the evolving and pressing issues pertaining to the environment and wildlife. Albertus Magnus in New Haven is one of the many colleges in Connecticut built upon a liberal arts tradition. A Catholic college, Albertus was founded in 1925 by the Dominican Sisters of Peace and was a women's college until 1985. The school, located two miles from Yale, has an enrollment of nearly 1,500, with 500 being full-time, traditional undergraduate students. Since its inception, Albertus has invested in the power of a liberal arts education. Undergraduate students can choose from more than 50 undergraduate programs of study and 10 master's degree programs, from art management to sociology. Students can also choose from a range of concentrations, sequences, and minors, and the school offers experiential learning in the form of internships, field experiences, service learning, and collaborative research. The school's East Hartford campus focuses on flexible learning, offering accelerated, undergraduate, and graduate programs for working adults looking for a curriculum that can accommodate their schedules. Founded by the Sisters of Mercy in 1932, the University of Saint Joseph (USJ) provides a rigorous liberal arts and professional education for a diverse student population in an inclusive environment that encourages strong ethical values, personal integrity, and a sense of responsibility to the needs of society based on a proven track record of empowering students to succeed and lead. Students select from an array of dynamic majors and minors, dual majors and concentrations, and then proceed to realize their ambitions. Experiential learning is incorporated across the curriculum, and faculty prepare students for meaningful professional careers or graduate studies. Seamless degree programs save time and money, and build the foundation for a great career as many degree programs lead to professional licenses. As an NCAA Division III school, the University of Saint Joseph hosts twelve varsity teams, intramurals, numerous recreation and wellness programs. The University is a member of the National Collegiate Athletic Association (NCAA) and the Great Northeast Athletic Conference (GNAC).The 90-acre suburban campus in prestigious West Hartford, Connecticut is known among colleges for its aesthetics and prime location: a few miles from major employers, or entertainment and shopping in Blue Back Square, and midway between Boston and NYC. UHart got its start in 1877 as the Hartford Art School, which was founded by a group of women that included Olivia Langdon Clemens (Mark Twain's wife) and Harriet Beecher Stowe. In 1957, the school was chartered into its present-day form, and today, more than 6,600 students attend the University of Hartford, including 5,000 undergraduates. While it is one of the larger Connecticut colleges, UHart strives to keep its class size down, aiming to provide more personal instruction for all students. The student-to-faculty ratio at UOH is 9:1. Undergraduate students have around 100 majors to choose from, and there are currently over 60 graduate-level programs. The university plays at the Division I level and is a member of the American East Conference. Notable alumni include former Houston Astro Jeff Bagwell, four-time NBA All-Star Vin Baker, and pro golfer Jerry Kelly. In the sciences, the school has also emerged as a leader; UHart serves as the lead institution among all colleges in Connecticut for the Connecticut Space Grant College Consortium. UNH is a private, coeducational university that welcomes some 6,800 students a year, including more than 5,000 undergraduates. Founded in 1920 on the campus of Yale University, the school moved to its present location in 1960. UNH offers nearly 55 undergraduate programs and 50 interdisciplinary minors. Forty-one percent of UNH students hail from Connecticut and 15% are international. For decades, the school has fostered a global link with students and universities from around the world, and in 2012, UNH opened its first international satellite campus in Prato, the second largest city in Tuscany, Italy. As students will find with the best colleges in Connecticut, campus life at UNH fosters a sense of community. The school is home to more than 160 clubs and organizations, including the student-run newspaper The Charger Bulletin (official since 1938), and the radio station WNHU-FM, which dates back to 1973. Also from 1973 is the school's Black Student Union, which was born out of the Civil Rights Movement and was the first student organization for students of color on campus. The University of Bridgeport was founded as a junior college in 1927. Today, UB enrolls more than 5,600 students and offers undergraduate and graduate programs in fields such as business administration, criminal justice, human security, fashion merchandising, and East Asian and Pacific Rim studies. UB also maintains a comprehensive list of health sciences offerings, including degree, postgraduate, and continuing education programs in areas like dental hygiene, nutrition, and acupuncture. The university provides flexible degree completion programs and accelerated classes. Online students take courses asynchronously, and programs are available in fully online and hybrid formats. UB boasts the lowest tuition rate among private colleges in Connecticut, and more than 96% of UB students receive financial assistance. Students have opportunities to engage with Greek life, participate in student organizations, and pursue internships and leadership opportunities. Established in 1999, Goodwin College is one of the newest colleges in Connecticut. A private, four-year institution, Goodwin offers classes year-round in an effort to best meet the scheduling needs of its students. The school offers flexible learning for certificates as well as associate and bachelor's degree programs. Available undergraduate majors range from business administration to nursing to social work, and through accelerated learning, full-time students at Goodwin can earn their four-year degrees in as few as three years. The school aims to meet the educational needs of those that may be underserved in the region; more than 3,000 students now take courses with Goodwin, with 43% of them being the first in their families to attend college. Connecticut is home to 12 community colleges and vocational schools, governed by the Connecticut State Colleges and Universities (CSCU) system. These higher learning institutions offer thousands of degrees and certificates designed to prepare students for employment in the local workforce. Students completed 7,749 two-year degrees and certificates at Connecticut's community colleges during the 2013-2014 academic year, representing an increase of 62.8% since 1994. The CSCU system co-sponsors several initiatives to support employment of community college grads and local industry, including the Connecticut Manufacturing, Energy and Transportation (CT-MET) initiative. According to the U.S. Department of Education, graduates of top community colleges in Connecticut have an earning potential of at least 50% more than students with only a high school diploma. The CSCU also supports the Transfer and Articulation Program (TAP), newly implemented to help community college students transfer credits or complete their degree at a four-year state school. In 2014, the "Transform CSCU 2020" initiative began, aimed at improving the overall student experience through individual efforts to expand early college programs, improve student retention and build partnerships with local businesses. Enrolling in a two-year program now allows you to take advantage of these opportunities; search our ranked list to find your school. Manchester is a two-year college in Connecticut offering over 90 degrees and certificates, these include associate in art and associate in science degrees in more than 40 disciplines. This number continues to grow, as the college stays up-to-date on workforce demand and updates its programs accordingly. MCC offers credit-free, professional development courses, such as Allied Health: a one-year course that focuses on preparing for high-demand health occupations. MCC emphasizes small class sizes, individualized attention, community, and diversity for an enhanced student experience. The college is technology-rich, with over 100 intelligent classrooms. MCC encourages extracurricular activity, they offer more than 35 student clubs, mentoring programs, and organizations, including the award-winning newspaper, The Live Wire. In February and March this year, the college is introducing accelerated 8- and 12-week courses, on-campus and online. These courses are worth an additional 3 to 4 credits. One of the longest-serving community colleges in Connecticut, Quinebaug Valley enrolls around 2,000 credit and 3,000 non-credit students every semester. The college concentrates on offering a wide range of degree and certificate programs for people of all backgrounds. Students can study either an Associate in Arts (AA) or Associate in Science (AS) degree program, the former is more suitable for learners transferring to a bachelor's program after graduation. QVCC's AS programs, such as the AS Technology Studies, are more career-oriented – with a broad range of course concentrations including Biomolecular Science, Computer Aided Design, and Plastics Technology. Students are encouraged to become an active part of the community and participate in on-campus activities. Upcoming monthly events include a ski trip, a dance, and the Baugstock music festival. QVCC hosts local, regional, and national shows and events at the Spirol Art Gallery. Northwestern Connecticut, located in Winsted, offers programs for non-degree and degree-seeking students. Learners can achieve their learning objectives by choosing from personalized training, certificate programs, or two-year degrees in over 40 subject areas – including Early Childhood Education, Fine Arts, and Allied Health. Tutoring is available for free. NCCC is committed to providing accessible, high quality education to students, giving back to the community, and allowing students to make an impact. The school offers an extensive catalog of course offerings, giving students the opportunity to learn and grow outside of an academic setting. On campus students can make the most of clubs, volunteer, and community service opportunities, including poetry, lectures, and art. Students can contribute their original work to several outlets: NCCC's online magazine, Gloss; the Gallery at Northwestern Connecticut's Founders Hall; Mad River Anthology; and the Mad River Literary Festival for poetry and creative writing. Asnuntuck is one of the smallest community colleges in Connecticut, it also serves students living in Western Massachusetts. The college offers 42 programs in total: a broad range of credit degree, certificate programs, and non-credit certificates in healthcare. Degrees available include accounting, business administration, and criminal justice. Non-credit certificates include EMT, Basic Skin Esthetics, and Personal Trainer National Certification. The school's main focus areas are Manufacturing Technology, Personal Enrichment & Continuing Ed, and Business & Industry. Students can take up new subjects involving anything from Human Services to Machine Technology. ACC upholds a thriving student life on campus, including events, activities, and clubs organized by students. The Student Senate helps peers to make decisions about their educational pursuits. There are career development services and resources available, including an extensive range of products at ACC's bookstore and free childcare offerings. All students have the opportunity to become a part of the school's radio program. Accredited by the New England Association of Schools and Colleges (NEASC), Norwalk Community was the first established public, two-year community college in Connecticut. NCC is the most popular college in the area for Fairfield County residents, currently teaching around 6,500 students. Norwalk offers 45 associate degrees and 26 certificate programs in liberal arts, sciences, career, and technical subject areas – from Interior Design to Medical Office Management – all with a hands-on approach to learning. All credits earned at NCC are transferable to four-year colleges and universities, and prepare students for dynamic careers and leadership roles. Well-known graduates of Norwalk include Connecticut's Lieutenant Governor Michael Fedele, Norwalk Mayor Richard Moccia, and major league baseball pitcher Erik Bedard. NCC has more than three dozen student clubs, special interest groups, and organizations. The college runs several valuable student centers including wellness, counseling and career, and tutoring. Naugatuck Valley, comprised of two campuses, offers 88 programs of study: including the first-of-its-kind 22-month program in Advanced Manufacturing Technology. Other unique credit and noncredit degrees and certificates include Astronomy, Horticulture, and Cybersecurity. NVCC recently opened an extended campus in downtown Danbury for more than 1,200 students, a student body that has grown steadily since 2009. This makes the campus among the newest of Connecticut community colleges, and has enabled the college to increase their course offerings. The new Weekend College program (available at both campuses) allows students to complete fully transferable associate degrees by attending classes part time. The Waterbury campus is next to Connecticut's Glacier Ridge Trail, a popular hiking destination for students. By day, students can also participate in clubs, the student government, or service to the local community. By night, they can attend exciting events, performances, and lectures. Housatonic is a two-year community college in Connecticut's largest city, Bridgeport, with an 11-town service area. The campus accommodates over 6,000 students and extensive classroom, lab, and studio space. HCC also features the Housatonic Museum of Art -- one of the largest art collections among two-year colleges in the Northeast -- and a Sculpture Garden, with a collection of over 4,000 works. At HCC there are 66 degree or certificate programs to choose from, including a brand new Radiologic Sciences associate degree and a selection of student success programs. Other programs include Allied Health, Education, and Criminal Justice. The college's Academic Support Services are far-reaching: resources include prep classes and refresher programs, Writing Across the Curriculum Center, free online and offline tutoring, computer labs, and workshops. HCC offers a virtual career coach to provide information about estimated salaries, current job outlook, and resume improvement. As of 2010, Gateway Community College had the highest credit enrollment of community colleges in Connecticut. 14,000 students each year choose from more than 100 accredited associate degrees and certificate programs. There are three associate degrees available to fit every student's needs: the Associate in Arts, the Associate in Science, and the Associate in Applied Science. Students can select from a diverse set of subject areas, including Hotel-Motel Management, Nutrition and Dietetics, Biomedical Engineering, and Nuclear Medicine Technology. The campus includes state-of-the-art amenities such as computer labs, a small business center, a health center, and a culinary arts center in its 358,000-square-foot campus. Gateway is a member of the National Junior College Athletic Association (Region XXI), and allows students to participate in intercollegiate, intramural, and club sports. Teams have achieved notable success; the men's basketball team has made seven appearances in the NJCAA Region XXI tournament and several players have been named All-American. Three Rivers Community College is located in Norwich, Connecticut, and offers 78 certificates and degrees that prepare students for four-year programs and entry-level jobs. Students may pursue their associate degree in expanding fields like manufacturing engineering, computer science, and social work studies. TRCC also offers workforce and community education programs for individuals who want to improve certain skills without earning a credential. Because the school strongly believes in equitable educational opportunities, TRCC accepts applications throughout the year without any GPA or standardized test requirements (with the exception of the nursing program). Community colleges in Connecticut are frequently praised for their affordable tuition rates, and TRCC is no exception. Financial assistance is available, including awards for high-achieving and first-generation candidates. Students also have access to career guidance and internship/service learning opportunities. Additionally, TRCC provides convenient transfer pathways for graduates who want to enroll in partnering four-year institutions. Celebrating 50 years as "the college of its community," Middlesex Community College provides high quality, affordable, and accessible education to an 18-town region of CT. Each year, the college admits more than 4,000 credit and non-credit students from over 100 CT towns and cities, with 75% of them qualifying for federal financial aid or scholarships. MxCC offers more than 60 degree and certificate programs including an honors program, general studies for students who are exploring career options, and fast-track or self-paced learning options. Majors include criminal justice, communications and multi-media, ophthalmic design, and dispensing, among others. A range of non-credit courses are also available for students looking to quickly enter the workforce. The main 38-acre Middletown campus and MxCC @Platt provide cutting-edge technology and facilities, along with many leadership, civic, and social engagement opportunities for students. To support student needs, the college opened a Magic Food Bus food pantry in 2016 in an effort to alleviate food insecurity among students and their families. If you're thinking about applying to one of the best colleges in Connecticut, continuing reading to learn more about living in the Constitution State. What Connecticut lacks in square mileage, it makes up for in population density; this small northeastern territory is the nation's fourth most densely populated state. In addition to its closeness to New York City, seasonal beauty and colonial charm, Connecticut is desirable for its historical Ivy League colleges and universities. Originally a Dutch settlement site, Connecticut is aptly named "the Constitution state" for its role in the establishment of federal policy and governmental organizations. In fact, many private colleges and universities in Connecticut were founded before the 19th-century, with some dating back even earlier; Yale is among the oldest schools in the nation, founded in New Haven, CT in 1701. The U.S. census estimated that Connecticut had a a per-capita income of $38,803 as of the most recent statistics from 2016. Also according to state information provided by the census, Connecticut is home to higher numbers of high school graduates and bachelor-degree graduates than the national average. 89.5% of residents 25 and older have at least a high school diploma, compared to 86% nationwide; 37% of Connecticut residents 25 and older hold at least a bachelor's degree, versus 29.3% overall in the U.S. Below we have outlined similar characteristics of each region of the state. Though the cost of living in Connecticut is higher than the national average and admission into one of the state's prestigious colleges or universities is highly competitive by design, establishing residency is a must for serious students. Typically, all students of the legal age (18) are required to prove residence or be prepared to meet legal guardian residency requirements if they are under the age of 18. Details vary depending on individual rules and regulations. A minor student depends on his or her parents or legal guardians to prove residence in Connecticut. To claim residency, a minor must prove that he or she lives with their parent(s) or legal guardians in their household in Connecticut. If the parents are divorced or separated, the minor must reside with the parent who lives in Connecticut. Minors must begin living with their Connecticut parent before they turn 18 and prove that they intend to continue living with that parent until the school year starts. You must physically reside in Connecticut for at least one year prior to declaring residence. You must declare intent to make Connecticut your home; you cannot move to Connecticut simply to pursue cheaper tuition for your education. Typically, you must be able to prove your financial independence as an adult of legal age.